What type of marquee should I have for my party? What type of marquee should you hire for your party? Where do we start…? Marquees come in a variety of shapes and sizes and this article’s aim is to give you a non-biased overview of what’s on offer in the marquee market. As luxury party planners, we don’t own any marquees ourselves, but we work with some of the UK’s leading marquee companies, so you get access to our best suppliers. We specialise in transforming their marquee structures into stunning venues for your event. From Tipis to Big Hats, clear roof, house extension marquees to traditional marquees, we know the perfect structure for your event. We can talk you through the pros and cons of each and help you decide which type of marquee is perfect for your party. Stretch tents are a flexible alternative to a traditional marquee. These freestyle structures cover any shape or area you like including steps or uneven ground. They can fix onto a building to provide a transition between indoor and outdoor space, or can be set up as a freestanding structure. Striking, eye-catching while still practical, stretch tents suit all kinds of party, providing the ultimate blank canvas. If you’re looking for a party marquee with the wow factor or a festival feel, a tipi tent is ideal. These spellbinding structures provide an atmospheric alternative to a conventional marquee. With a distinctive cone shaped appearance, tipis come in all sizes, from small tents suitable for camping or breakout groups to large marquees to fit all your wedding guests, corporate delegates or party-goers. Also known as pagoda marquees, Chinese Hat marquees are named for their distinctively shaped roof. They are an attractive and modern style of tent, ideal for small, intimate events or to be used in combination with a traditional marquee as a bar, reception area or entrance porch for larger celebrations. Pointy-topped Chinese Hat marquees can be open, roof-only structures, or have sides with or without windows for ultimate flexibility. Capri marquees offer a spacious and modern design which has no need for ropes or guy lines. They can be linked together to create a large and flexible party area with removable walls for weather protection. If you’re looking for a funky and alternative outdoor venue for your party, Capri tents are a cost-effective and eye-catching solution to add style and drama to any occasion. Big Top marquees are a popular choice for the larger outdoor events with large guest numbers. Apart from looking visually stunning, they also hold a very practical use for covering a huge circular area and with a blackout effect inside, perfect for the summer festivals in the sunshine! • Can be dressed to suit your occasion, formal or funky! A Clearspan Marquee is a versatile structure which can be used as a temporary building for long periods of time. Many wedding or party venues may already have a clearspan marquee in place in their garden or grounds, or as an extension of their indoor space. These large marquees are a popular choice because unlike traditional marquees or other kinds of tent, they have no poles on the interior to obstruct proceedings, and don’t require ropes or guy lines externally. They can be lined to look just like a permanent building and dressed to suit your party theme. Whether you want windows, a clear roof or even coloured walls, anything is possible! Too many people crammed into a small place is both uncomfortable and unsafe; conversely too large a space can make your event seem empty. Don’t forget, you need to allow room for a stage, dance floor, DJ, catering, reception, cloaks, toilets etc. Try to keep the length of the marquee to no more than three times the width to ensure maximum stability and to avoid a “tunnel” effect. 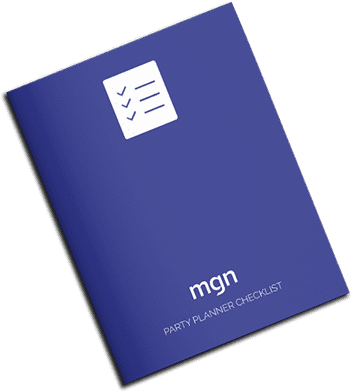 Don’t forget, MGN events are here to help with your marquee hire, and we can provide marquee hire to anyone anywhere, it doesn’t matter how uneven your plot of land is, we can make it work! Why not get in touch with us and talk to us about our marquee services. Planning a party? Download our guide.